The successful management of change is crucial to firm survival and success. Many firms have responded to the challenges they face by incorporating quality-based strategies to their change management approach. A commitment to quality can drive firms to make significant improvements in profitability, productivity and competitiveness. A recent paper of mine, co-authored with Prof. Stephen Roper, Warwick Business School, examines the impact of introducing quality improvement methods (QIMs) on firm innovation in Irish manufacturing plants. Prior studies have been based on cross-sectional analysis making causality difficult to identify, and providing little information on the nature of the learning effects and lags involved in QIM adoption and its potential benefits for innovation. We ask whether, and over what period, the adoption of QIMs (e.g. ISO9000; Total Quality Management; and Quality Circles) impact on plants’ innovation success. Our empirical analysis reveals short-term disruptive and longer-term beneficial effects of QIMs on product innovation performance. In addition, the organic versus mechanistic nature of QIMs has some bearing on this temporal relationship. Empirical findings also highlight the role of complementarities and learning-by-using effects in shaping the quality–innovation relationship. The adoption of QIMs has significant implications for plants’ product innovation outputs, albeit with some time lags as internal routines are optimised. Quality improvement strategies and implementation plans need therefore to consider their innovation implications and any consequent impact on firm performance. Full paper can be accessed here. For more than 30 years, Economic Policy has been publishing papers on pressing European policy issues. Preliminary versions of the papers are first discussed at Panel meetings. The 65th Panel meeting, which starts today in Valletta, features papers on the causes of Brexit, on the consequences of Brexit, on the impact of the 2015 reforms on the Italian labour market, on innovation, on entrepreneurship, on retirement, on monetary policy, and on mobile communications. The papers are available here. Academics and policy-makers agree that innovation is of critical importance for business productivity and growth, explaining the substantial body of research in this area. There is broad consensus that factors, such as R&D spend, firm age, firm size, sector, ownership and location, influence innovation performance, with many studies finding evidence of these relationships in Irish firms. Recently, with my colleague Frank Crowley, I have begun to investigate the influence of human resource practices on innovation performance. A recent OECD report “The Future of Productivity” (pdf) presents a new perspective on what drives national productivity growth. The OECD explains that in every world economy there are some ‘frontier firms’ which are internationally competitive and match global high standards in productivity. However, the majority of firms – up to 80 per cent – are not in this category. These firms may have a more domestic market orientation, and much lower average productivity and the OECD calls them ‘non-frontier firms’. 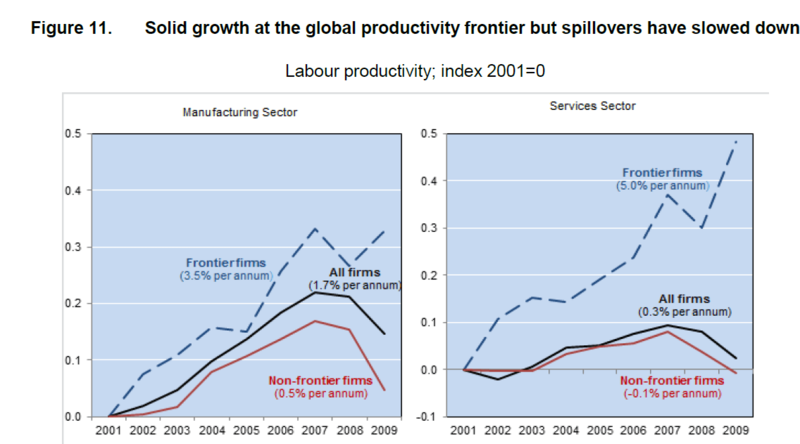 The OECD illustrate the productivity gap between frontier firms and non-frontier firms over the last decade for OECD countries. Productivity growth in frontier firms has been around 3.5-5.0% per annum compared to -0.1 to 0.5% per annum in non-frontier firms (see graph below). The OECD explains that the ‘productivity slowdown is not so much a slowing of innovation by the world’s most globally advanced firms, but rather a slowing of the pace at which innovations spread through the economy: a breakdown of the diffusion machine … the gap between those high productivity firms and the rest has risen’. What should policy-makers take from these findings? The frontier firms have a competitive advantage from their investments in knowledge-based capital, but also how they tacitly combine computerised information, innovative property and economic competencies in the production process. These firms are leaders in new-to-the-market innovations. But it is not only new-to-the-market innovation which matters for productivity. Policy-makers must focus on improving the take up of new innovations by the vast number of non-frontier firms which are more likely to find success with ‘me-too’ or ‘new-to-the-firm’ innovations. To maximise productivity gains we must aid the acceleration of the diffusion of innovations to non-frontier firms. The diffusion of innovations is good for growth, and the OECD argue that more effective diffusion may also promote inclusiveness. A recent study by Card et al. (2013) suggests that the observed rise in wage inequality appears to at least reflect the increasing dispersion in average wages paid across firms. Thus, raising the productivity of laggard (late adopter) firms could also contain increases in wage inequality, while reducing costs and improving the quality and variety of goods and services.